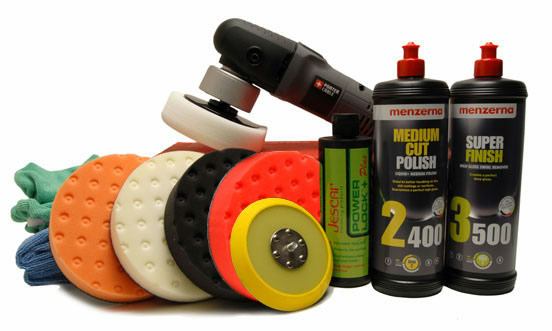 The Menzerna Porter Cable Ceramic Show Car Kit is designed for ceramic, scratch resistant clear coat paints. Menzerna developed two polishes to correct the hard, new paints: Super Intensive Polish and Super Finish. At the end of 2003, Mercedes Benz put into production a new scratch-resistant clear coat lacquer made up of nano-sized ceramic particles, which are baked and hardened in the paintshop oven, just like you�d bake pottery in a kiln. This process results in an extensively cross-linked, very hard paint finish that stands up better to mechanical car washes and day to day abuse. The Menzerna Porter Cable XP Ceramic Show Car Kit is made to correct hard, ceramic paint and restore the shine. Menzerna Medium Cut Polish 2400 has become the industry standard for the automotive OEM assembly plants as well as the professional reconditioning detailers and enthusiasts. The introduction of a new generation of scratch-resistant clear coat proved to be a difficult challenge for the conventional polishes. Menzerna Medium Cut Polish 2400 uses a new polishing technology that was required to eliminate the sanding scratches that are a result of the coating repair process. These 2000 grit sanding marks had to be quickly repaired on the assembly line to ensure that the line would not be held up. Despite the difficulty of the challenge, the engineers at Menzerna successfully developed the first generation of polishes for scratch-resistant clears. Menzerna Super Finish is the updated version of PO 106 FF. This fine abrasive polish removes imperfections in the new, hard, ceramic clear coat paints. This is part of the same family of polishes used in Mercedes plants in Germany and select auto plants and repair shops in the U.S. to remove swirls and overspray from brand new paint finishes. Super Finish is capable of removing 2500 grit sanding scratches, haze from compounding, light swirls, and mild oxidation while restoring a glassy, smooth shine. Menzerna Power Lock Polymer Paint Sealant is loaded with synthetic polymers to produce the ultimate shine with exceptional durability. Menzerna Power Lock Paint Sealant is easy to use. Mount the included Lake Country CS 6.5 Inch Red UltraSoft Wax/Sealant Pad to the Porter Cable 7424 XP and spread over the paint on speed 3-4. Allow Menzerna Power Lock Paint Sealant to haze. While the Power Lock is hazing your paint is being loaded with millions of high tech polymers that form a UV shield. Wipe away with a soft microfiber towel to reveal a mirror like shine. Four 6 Inch Cobra Microfiber Bonnets are well-made, reversible, and machine washable. With a 70/30 blend, they are super soft and gentle on all paint finishes. 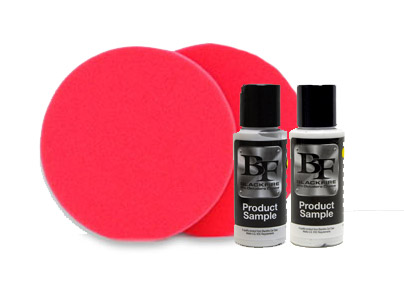 Cover your foam pad directly or layer them over the lamb�s wool leveling pad for a more cushioned application. Either way, they are superior at applying products, polishing and shining. The CCS Orange 6.5 Inch Cutting Foam Pad is included for general swirl and defect removal. They are less aggressive than the yellow pads. Use the orange pads to apply swirl removers and polishes. The CCS Black 6.5 Inch Finishing Foam Pad will apply waxes and paint sealants flawlessly. The soft foam is firm enough to remove light buffer swirls during final finishing. The CCS 6.5 Inch Red UltraSoft Wax/Sealant Pad is made of soft, imported foam that is ideal for applying the final coat of wax or sealant. The foam works especially well when applying liquid waxes or sealants because it is firm enough to keep the majority of the product on the paint, rather than soaking it up. The red foam has no cut or cleaning ability. A total retail value of $356.87. Save $88.88!